Only Child wearing the old now tattered jeans - obviously when jeans saw better days. The 1950s and early 1960s were the heydays of the big department stores – the Simpson’s and three Eaton’s stores downtown. The latter stores originated with a small Toronto shop, which Timothy Eaton opened at Queen and Yonge St. in 1869, and replaced with the four-storey flagship Eaton’s in 1883. In 1930, The ritzy Eaton’s College St. Store opened at College St. and Yonge St. [See “Eaton’s” and “The Carlu” on Wikipedia.] Mom turned up her country nose at it and steered me towards its opposite, The Eaton’s Annex, Albert St. Did Mom gravitate towards this store because its three storeys and basement sat on a downtown street carrying Dad’s name? Or was it the anticipation and joy of flipping through clothes and shoes stacked on tables in the basement and if you were lucky, you’d find a bargain that you weren’t embarrassed to wear? More than the clothes and shoes, I remember the soft ice cream, the elevators and the escalators. “Hold onto the railing, Sharon,” Mom says as we stand at the top of one of these escalators. As I dig my hand into the railing and look down at the ridges before me, I hesitate, then gingerly place toes, then the rest of my feet on the escalator floor. I expect the floor to change to steps, like those at the main Eaton’s store, but it remains a series of slabs rudely jutting out. Riding up makes me feel as if I’m on a conveyor belt in a factory assembly line; riding down is akin to standing on the poor person’s roller coaster without the safety bar across your front. The elevators, off in their own hallway, are an earlier version of panoramic elevators, except the view is inside the shaft while you wait outside the glass door for the elevator’s arrival. I close my eyes, hang on tight to Mom’s hand and try not to think of freefalls. But we arrive safely back in the basement or “subway” as Eaton’s calls it. I know that I deserve the soft white ice cream whirled into a cone sold at a stand near the underground walk to the main Eaton’s Store. I also deserve the hot dog sold there. The study, mentioned above, showed that among older Taiwanese people, at least twice weekly shopping could raise life expectancy an average of 27 per cent. Surprisingly, men engaged in retail therapy more than women. Researchers believed it was not all about the buying but companionship and exercise could be factors. Not for me. I wanted to buy. However, I had two items in mind – a new mini stereo system to replace the dud that died in January after just over two years of “service,” and a pair of “good jeans” to replace the pair now sporting rips and holes. True, I was thinking of my Mom’s and my trips downtown as I rode the streetcar there and walked through the Eaton Centre (definitely not there back in the day). But successfully purchasing the two items needed without hitting more than one store (Sears, if you want to know. I didn’t even enter The Bay which now sits on the old Simpson’s store). Even the sprinkling of rain on the way home didn’t dampen the expedition. I just opened my umbrella and held it over the box containing the stereo. So, can retail therapy help? Maybe as long as you don’t play shopaholic. The life expectancy criteria is still off the table for me – I’m not quite as old as the study’s participants…yet. But it sure lifted my mood. Check out these websites for a couple of retail therapy studies. Your thoughts on Retail Therapy? My annual gardening trek to Canada Blooms yesterday turned into a big hunt and find. Not all was of the garden variety. First my friend Carol and I had problems finding my cousin Kathy and her friend Lynn in the huge conference centre. I figured we’d all connect at lunch. We did, through food, as I saw them carting around their plates of food two hours later. Turns out we all mixed up our entrance locations. The venue had so many you would have to make like a spider plant and spread your tentacles to all entrances at once. Finding specific exhibits was another matter. Unlike the weeds in my garden and my late Mom’s garden, the searched-for exhibits didn’t just pop up. I blame it on a badly designed Canada Blooms calendar booklet. I am not an expert in designing (my garden is partly by planning and partly by serendipity) but here is where the booklet provided problems. These design/information problems are a lesson for those of us who have to design anything. The print was tiny and not every actual booth/exhibit was shown. I couldn’t find the VIA Rail booth for the VIA rail garden route contest entry. Not good for the daughter of a railway man who rode the rails with her Dad and Mom as a child. And definitely not good for a gardener. The Marketplace was much tinier than other years and there didn’t seem to be many garden accessories booths. Still I managed to buy three plants: two lavender which will go outside later in the spring, a spring cactus with both white and fuchsia flowers ready to open, and a wind charm that might actually be heavy enough to avoid getting blown away by high winds blasting across my front veranda. And the garden designs were superb – more down-to-earth for actual home gardens, including one featuring the front of a house, some interesting pond setups, and plenty of colourful and fragrant flowers. I also connected with a representative from another gardening magazine – another possible market for my garden stories. The big bonus for me was finding some new ideas on how to do my new gardening passion – vertical gardening. The four of us gals also had a good time – even though Lynn lost her non-prescription reading glasses. 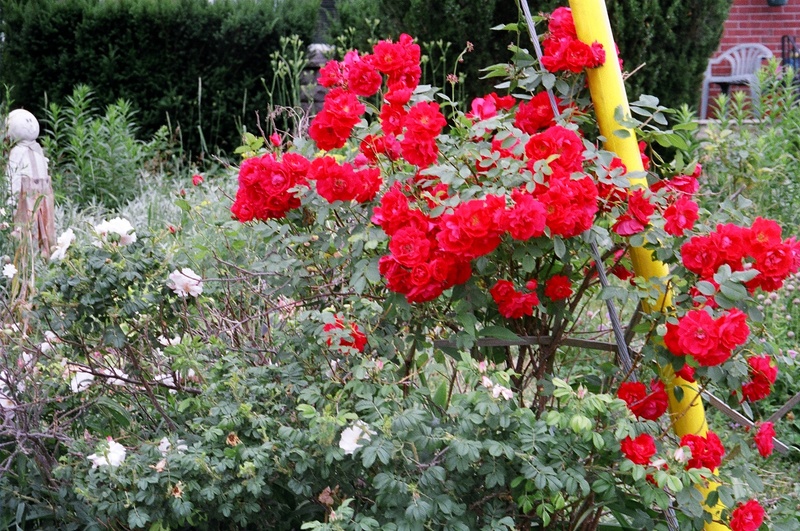 Despite all the finding problems, I know what I found was worth it – friendship with friends and family, the gardening plants and supplies, and the gardens. It was worth all the rambling up and down, and across the aisles, with several rest breaks. I may not win the VIA rail contest but I can check out their garden routes online or pick up flyers on it at Ontario Travel or Toronto Union Station. What we found tops what wasn’t. Now, I have to get outside on the backyard garden patio and eat some lunch. It is now 16 Celsius (about 62 Fahrenheit) going up to 22 Celsius (about 74 Fahrenheit). Better enjoy it before we crash to early spring weather this Friday and Saturday. Only Child looks forward to quiet time on the patio in the back garden. I need to garden now to heal. And the weather and the garden itself look promising. Monday, I saw the first robin of the season. The robin was moving across my front yard. The lawn hasn’t yet turned green, but in the back clumps of tulips and hyacinths are poking above the ground. I need colour, so yesterday I “dragged” my legs over to the local garden centre and bought two potted pansies. I put one on the picnic table on the backyard patio and hauled out a small table for the veranda and placed pansy plant number two there. Already I’ve been sitting outside to eat breakfast and lunch. Now with daylight saving time, dinners outside will soon follow. This winter may have been the warmest in years in southern Ontario, Canada. But it also turned into one of my worst winters for physical health problems – two viruses in a month, acting as catalyst for a severe Vitamin D and Calcium deficiency causing extreme pain in the bone below my knee. Hence the dragging my legs to and from the garden centre. So, I repeat, I need to garden to heal. I need to get outside more in the sunshine. I need to remove the dead tops of last year’s perennials so this year’s perennials can appear and blossom. I need to turn the soil. I need to plant seeds – once my seed order comes through. Like nearly everything else, preparing the seed order and mailing it got put on the back burner until it threatened to burn. I need to tour the garden and see the wonder of what is happening. I need to sit out more in the garden, on the patio and on the veranda. Then I can receive the gift of Vitamin D from the sunshine and my leg will continue to heal. Just going outside into the garden, and buying the pansies lifted my spirits. Gardening is therapeutic. 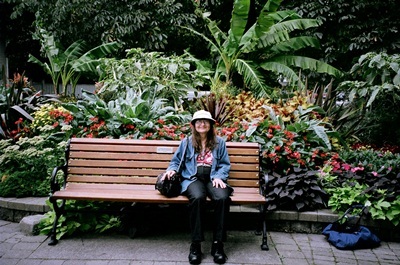 As Anne Marie Chaker writers in The Wall Street Journal http://online.wsj.com/article/SB10001424052702304620304575165831058222608.html, many nursing homes and hospitals are incorporating gardening of some sort – even just sitting out in the garden – as a way to heal. 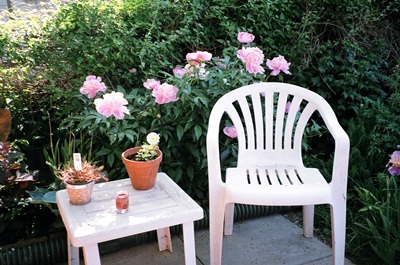 Being in a garden can change moods from bad to good and lower the stress level. When I yank out weeds, I pretend I am yanking my problems out of my life. That gets interesting when I superimpose a person (or persons) who have been making my life hell. But it beats yelling at the person, and afterwards I feel at peace and many weeds now lie in the compost or yard waste bin. Horticultural Therapy, although emerging as a trend in healing therapy, is not new. Dr. Benjamin Rush, who signed The American Declaration of Independence, said that gardens held “curative effects” for mentally ill people. (See http://www.ahta.org/content.cfm?id=history). There are national therapeutic associations such as The American Horticultural Therapy Association (http://www.ahta.org) and The Canadian Horticultural Therapy Association which defines horticultural therapy (in part) as “Horticultural Therapy (HT) is a formal practice that uses plants, horticultural activities, and the garden landscape to promote well-being for its participants.” (See http://www.chta.ca/about_ht.htm for more information about horticultural therapy). Also see the CHTA’s links page (http://www.chta.ca/links.htm) which gives a bird’s-eye view of horticultural therapy in practice in Canada. In April, when the first tulip showed its face in the flowerbed under the living room window, Mom had to get out in her garden and do her vegetable, fruit and flower business. In the beginning, Mom and I moved in tandem with the garden and religion like we found parallels in them – both had beauty, filled us with awe, seemed to bring some order and ritual to our lives: plant seeds in spring and be rewarded with beautiful flowers and bountiful vegetables and fruit in summer; go to Mass and communion on Sunday and be rewarded in life with only good. For some of that time, Dad was still around to join us. And a footnote to last week’s posting on what memoir writing means to me… My guest blog, “Writing from the Heart,” about writing short personal essays/memoir for print and online publications appears on the Networds blog at http://www.networds.ca/Blog/content/writing-heart. 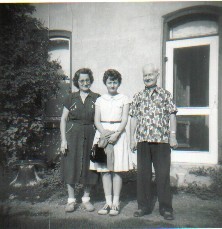 Only Child with Mom and Dad at her godmother's farm in the early 1960s. One of this Onlychildwrites blog followers, TrishaDM nominated my blog for an ABC (Awesome Blog Content) Award. Thank you again, Trisha (http://trishadm.wordpress.com/2012/02/27/alphabet-soup-the-abc-award/). One of the criteria for those who receive the award from its creator, Alyson, of the Thought Palette blog (http://thethoughtpalette.co.uk/abc-award/) is to nominate other blogs and also to share briefly something about yourself, from A to Z. So in the spirit of this nomination, I’m going to go right to the middle of the alphabet to M and share what memoir writing means to me. After all, this blog is about thoughts and offshoots, including a memoir, from growing up an only child of elderly parents. And in the two and a quarter years of posting, I’ve covered a lot of “offshoots” including health, relationships, the stress of living as an only (I call it the “only person syndrome”), writing – memoir and fiction, and, of course, the actual memoir. Writing a memoir is an ongoing process. When I thought I was done, I found I wasn’t. From family flak to finding new information and remembering more to getting a better idea on what to write and how to write it, I may be adding to the memoir as I go to my grave. (Hopefully a memoir book will be published long before then). This process has made me realize that although a memoir comes from your past, it also engulfs your present and no doubt will go into your future. Some days I feel as if the spirits of my late Mom and Dad are here. A psychic friend actually felt my mother’s spirit here. When I revisited the old house where I grew up, I did not feel the presence of either parents. However, on a return visit to take some outside photos (with the present owners’ permission) I did sense Mom’s presence, especially when I visited the nearby park where as a child I use to swing sky-high on the swings. It’s no wonder that some days I feel as if I am several people – the little girl walking through my past, the young woman who had to learn to get out of her shy hurt shell, to now where I’m still changing. Some days I feel younger; some days I feel older. Looking to the future is scary, but it is all part of my story, my life. Or as William Berry once said, The past is our definition. We may strive, with good reason, to escape it, or to escape what is bad in it, but we will escape it only by adding something better to it. Those are wise words for all of us, especially those of us who don’t want to forget the past but need to incorporate the present and move on into the future. Live life from the heart. 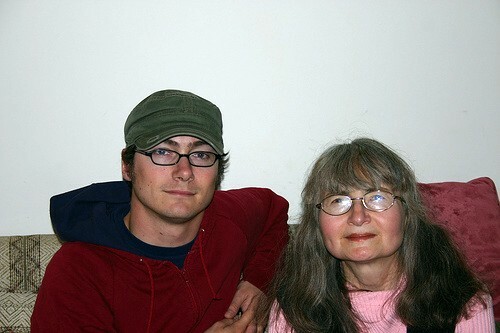 Only Child with her son, Martin, part of today's family. Martin is also "M," but son also comes under "S."